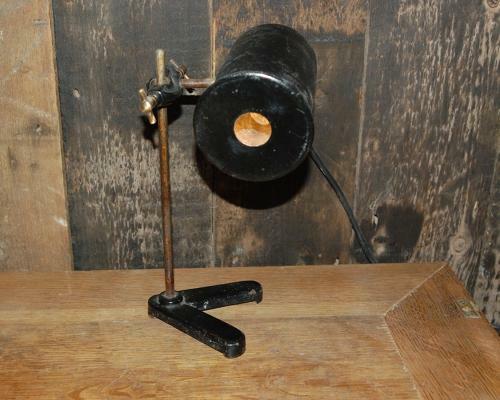 A fantastic, industrial style, metal doctors light / desk lamp. The lamp dates to the 1900's, approx. 1915-1920. The lamp has a removeable cover to focus the light and was used for looking at slides or other details. The light is bolted to the arm and the light can be angled. The metal has a slightly textured design. The lamp has a lab style base support. The lamp is rewired and in working order but MUST BE TESTED BY AN ELECTRICIAN BEFORE USE. The light is antique and therefore has some signs of use and wear, adding to the fantastic industrial look. There are some small areas of tarnish to the metal. Slight surface rust, scratches and marks. The lamp would be ideal for an office desk and has a wonderful design, giving great character and style to a home.